Mae Q'West and the Sign of the Stars is rated 2.4 out of 5 by 5. Rated 4 out of 5 by Melvin2 from Good story and Variety of Games I really enjoyed this - more than I expected. The HO is a little more challenging than many (partly because of the teeny tiny objects and partly because of my dark monitor). There were other puzzles as part of it: hangman, marble solitaire, match3, etc. And the story kept me interested although it seems there were some loose ends that never resolved. Overall, though, I liked it. 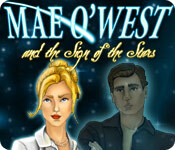 Rated 3 out of 5 by CrazyMooz from Mae Q'West and the Sign of the Stars. Nice game. Has issues. ~1. too many small objects hiding on same color. ~2 Game stops with no finish. But yet there is still areas that needed to . 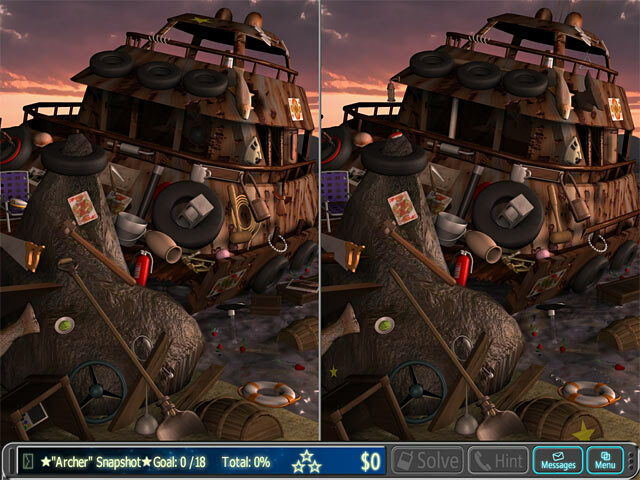 Rated 3 out of 5 by SeaBamboo from Fun game to play This is a Hidden Object / Find the Difference from BrandX Games in which you earn money to buy constellations from a Zodiac map which is available once you have completed the first ‘bonus’ level. 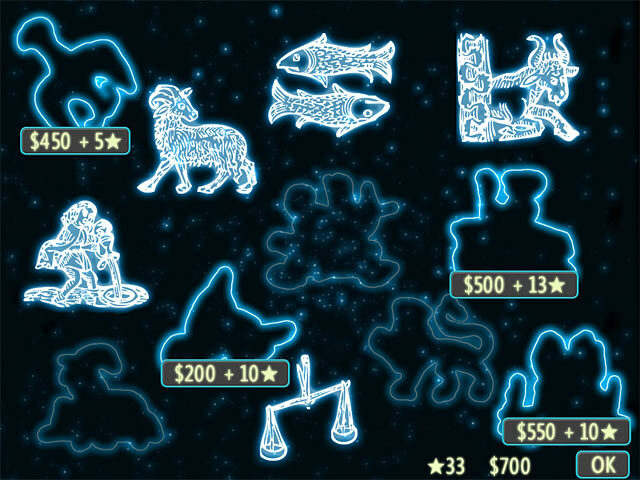 The price of each constellation is a combination of money & stars; if you purchase all 12 then an extra bonus level can be played at the end of the game. There are two types of main gameplay, one is H0 where for each item found you earn cash – beware though as a misclick will cause you to lose $2 and if you use the hint button it will cost you $5 then $10 for the 2nd hint, increasing the more you use it in a scene. You do not have to find all of the items although you do have to find one particular specified object. 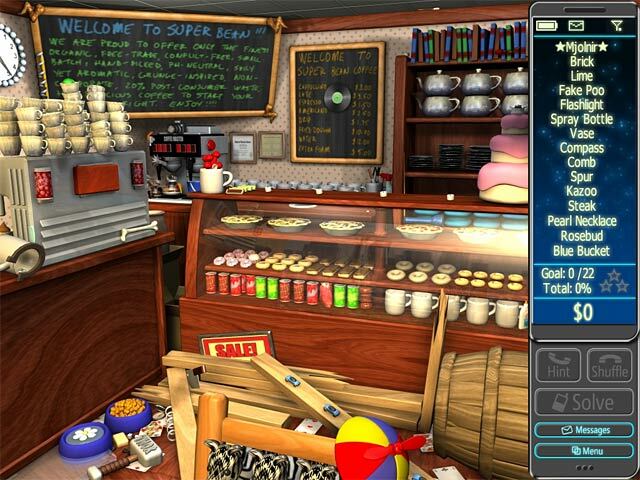 You will earn extra cash if you find 100% of the items in a scene. The second type of gameplay is a find the difference & for each one found you will earn money. There is a map which shows available locations, you click on the nameplate to go to that location & play. Once you get to the 3rd level of the game you can find stars in scenes which you will need to purchase the constellations. The graphics are very crisp & colourful, the artwork is cartoonish ; there is no music except on the map screen but there are ambient background sounds. Unfortunately my eyesight does not enable me to see many of the H0 items as they are too small but if this is not a problem this seems quite an amusing little game. There is a lot of ‘story’ to read but the screens are skippable as is the dialogue. My advice is to demo before buying. Rated 1 out of 5 by LoneCleric from Here's the deal... Back when I played the game for the first time, I failed to collect enough points to unlock the bonus screen. That annoyed me enough (I believe I'm a fairly good HOG player) that I decided to zoom through the game another time, just to unlock that darn screen. Once I was done, I decided that playing this twice was once too many, and that I would never, ever, play that horrendous game again. So while I usually replay bit of older games before writing their reviews, you'll understand that I didn't for this one. Sorry. But hey, whatever complaint other reviews have, I'm sure I agree. Rated 1 out of 5 by MEnr56 from STORYLINE ONLY THING GOOD ABOUT THIS GAME I don't know what to make of this game: *objects extremely tiny *many objects off-screen of the monitor *hint button (in the study) would light up 2 areas where it was obvious that NONE of the objects left to find were there but I clicked and clicked and clicked anyway and came up empty *the newspaper horoscopes were difficult to solve due to the fact that the blanks would accept ANY letter/ANY word with NO indication that you're typing in the wrong word until you've completed the word. A person could go on and on and on in trying to solve them and waste alot of time *key items were found (per cell phone messages) but you were STILL left wondering what else was needed in order to SOLVE the level; I just clicked on the SOLVE button and moved on The only reason why I continued to play was because the storyline was intriguing and I wanted to find out the ending. Have to say that this was not a game that I was happy with playing.